[S20] Letters between Eileen Huby and Jan Cooper from 14 February 2001. [S4500] Emails between Tony Goggins and Jan Cooper from 11 March 2003 Film 6909952. [S4500] Emails between Tony Goggins and Jan Cooper from 11 March 2003 Film 6909951. Francis Verrill was born in May 1815 he was born about a month after his father drowned at sea. 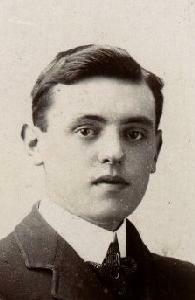 He was the son of William Verrill and Ann Brynton. [S3] GRO Indexes - 1873/Q3 Petersfield Volume 2c Page 122. [S41911] UK Census 1911 (RG14) - 2 April 1911 RG14 Piece 3088 RG78 Piece 111 Registrtaion District 33 Sub District 5 Enumeration District 1 Serial Number 198. He proposed to her in Stoughton Recreation ground and they were war time sweethearts before Stan and Florry Blay, of School Close, Guildford, were able to marry 60 years ago. 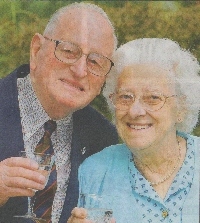 The happy couple, both 82 years old, celebrated their diamond wedding anniversary on Thursday 19 May, and were due to have been whisked off for a surprise lunch on Sunday by their adopted children. They met at Westborough Youth Club when they were only 16 and Stan was working in the local Co-op store, and romance quickly blossomed between the two, with Stan proposing three years later. However, fate intervened when Stan was called up to join the army and fight in the Second World War. 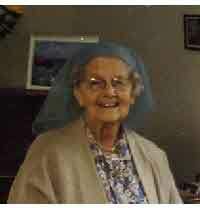 While Florry did her bit at home with the war effort and waited for her true love to return home. Stan travelled all over the world with the army and finally ended up as a prisoner of war in Italy. He made it safely back to Britain in 1945 and Florry said she was delighted to hear that he was home. "He sent me a telegram from Scotland telling me to go straight to the church and put the banns up" she said. They were married in Stoke Church shortly after with their friends and family in attendance. In the following years, Stan took up a job st Stoughton barracks where he worked for 40 years, as well as being a part-time sub officer for Guildford Fire service. And the couple remained involved with their local church and community. They adopted two children - from Barnado's, and now they have four grandaughters, and a grandson. "We couldn't have a party at our house to celebrate our anniversary because we have such a big family, so our daughter is putting on a party on the 28th of this month" said Florry. Regarding the secret to such a long, happy marriage, she said: "You have to be able to understand how things change and be willing to adapt to each other - It's about give and take. "2 Stanley died in April 2018 in Surrey, England. [S40045] Newspapers Times (Surrey weekly freebee) Week ending Saturday 28 May 2008. [S3] GRO Indexes - 1923/Q1 Guildford Volume 2a Page 166 - mother New. [S3] GRO Indexes - 1945/Q2 Surrey South Western Volume 2a Page 1388. [S435] E-mails between Peter Hugh Birks and Jan Cooper from 6 February 2003. [S3] GRO Indexes - 1893/Q3 Hartlepool Volume 10a Page 128. [S7] Ancestry.com - Birks Family Tree. [S390] E-mails between Kathleen Wright and Jan Cooper from 6 March 2013. [S41901] UK Census 1901 (RG13) - 31 March 1901 RG13 Piece 4639 Folio 25 Page 42. [S41911] UK Census 1911 (RG14) - 2 April 1911 RG14 Piece 25705 RG78 Piece 1474 Registration District 483 Sub District 1 Enumeration District 3 Schedule Number 13. [S3] GRO Indexes - 1921/Q4 Hartlepool Volume 10a Page 239. [S3] GRO Indexes - June 1988 Colchester Volume 9 Page 2285 age 95. [S378] E-mails between Hugh Reginald Birks and Jan Cooper from 16 January 2001. [S3] GRO Indexes - 1895/Q3 Hartlepool Volume 10a Page 158. [S41911] UK Census 1911 (RG14) - 2 April 1911 RG14 Piece 29664 RG78 Piece 1718B Registration District 545 Sub District 1 Enumeration District 64 Schedule Number 25. [S378] E-mails between Hugh Reginald Birks and Jan Cooper from 16 January 2001 Never married. [S3] GRO Indexes - 1897/Q2 Hartlepool Volume 10a Page 166. [S3] GRO Indexes - 1857/Q4 Sunderland Volume 10a Page 555. [S3] GRO Indexes - 1879/Q4 Hartlepool Volume 10a Page 171. [S7] Ancestry.com - Naturalization paper. [S20090] Emails between Margaret Duffy née Lamb and Jan Cooper from 31 December 2007. [S3] GRO Indexes - 1888/Q3 Hartlepool Volume 10a Page 119. [S41891] UK Census 1891 (RG12) - 5 April 1891 RG12 Piece 4066 Folio 126 Page 45. [S41901] UK Census 1901 (RG13) - 31 March 1901 RG13 Piece 4639 Folio 138 Page 38. [S41911] UK Census 1911 (RG14) - 2 April 1911 RG14 Piece 29617 RG78 Piece 1718A Registration District 545 Sub District 1 Enumeration District 17 Schedule Number 178. [S18877] Emails between Maggie Harvey née Dimelow and Jan Cooper from 5 September 2007. [S3] GRO Indexes - 1917/Q1 Hartlepool Volume 10a Page 201. [S47000] General Register Office, I hold a copy of death certificate 1923/Q2 Stockton Volume 10a Page 57 aged 34. [S40015] Cleveland Family History Society. Isabel Jameson married George Markwell in 1738/39 in Holy Island, Northumberland, England. Isabel was buried on 2 December 1790 in Holy Island, Northumberland, England. David Markwell was born in 1739/40. He was the son of George Markwell and Isabel Jameson. He married Mary Watson in 1762. He married Mary Walker in 1765 in Holy Island, Northumberland, England. William Markwell was born in 1741/42. He was the son of George Markwell and Isabel Jameson. Grace Markwell was born in 1744/45. She was the daughter of George Markwell and Isabel Jameson. Margaret Markwell was born in 1750/51. She was the daughter of George Markwell and Isabel Jameson. Margaret was buried on 5 May 1818 in Holy Island, Northumberland, England.